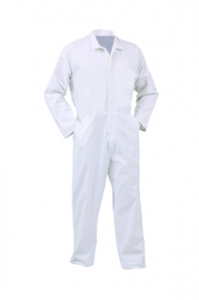 Full protective clothing is recommended to ensure comfortable working with our generally over active and excitable bees. Overalls should be chunky and comfortably fitting. We sell quality manufactured Bee Veils in Poncho style. Experience has shown that the Poncho style is more comfortable and less prone to penetrative excursions by persistent inquisitorial bees. The Poncho style Bee Veil which fits over the overall down to the waistline has been designed specially by Mike Miles without zips, pockets or Velcro to ensure safe & comfortable protective clothing which the bees cannot get through. We prefer this mode of clothing to the full bee-suit which is penetrable and cumbersome. Full beesuits can be specially ordered if desired but there will be a delayed delivery period. We sell Pigskin Gloves as these are generally found to be more user-friendly when handling frames and standard hive work. They also become more soft and pliable as they accustom themselves to the user’s hand. They can also be gently washed. 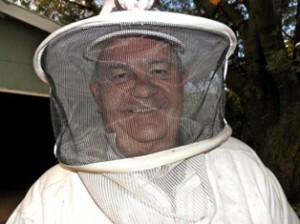 Their use encourages the ham fisted beekeeper to learn to handle his bees more gently and patiently. For more messy beekeeping work we also stock the red PVC gloves and Cotton Inner Gloves to absorb sweaty palms.